Chocolate lovers get all giddy inside when they see a chocolate fondue fountain in motion. It is as if you walked right into the Willy Wonka Chocolate Factory. Chocolate is glorious. Owning your own chocolate fondue fountain is even more glorious. In case you are new to this delicious venture, chocolate fondue can be done with different types of chocolate and there are a variety of different recipes available. Recipes for chocolate fondue fountains are typically included with the fondue fountain you purchase, and will include pre-mixed chocolate ideas specially formulated to use in chocolate fountains. We are guilty of constantly searching around for the absolute best when it comes to chocolate. Naturally, we are going to critique fountains that pour chocolate. Some names are just better than others. After many reviews, we found one that is the fountain to own. The name is reputable, the brown color compliments the chocolate tiers, and overall, it doesn’t clog as much as others. If you are about ready to take the chocolate plunge, grab a Wilton Chocolate Pro 3-Tier Chocolate Fountain, 2104-9008. This one is a smaller fountain. If you want to go commercial, then Sephra THE AZTEC 27″ Commercial Chocolate Fountain; this one is top of the line in every way. We made it easy for you to join in on the fondue craze! You can make smooth, flowing chocolate fountains without the use of oil. Use a rich chocolate which contains at least 33% cocoa butter makes the best flowing chocolate without using oil. Chocolate that is pre-mixed and meant for chocolate fondue fountains contains no oil. 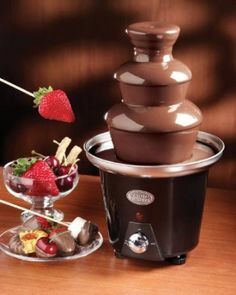 If you are using a huge chocolate fondue fountain, and feeding a lot of people, sticking with the premixed chocolate is a good idea. This chocolate is designed for this, and for keeping your fountain from getting clogged, preventing the chocolate from flowing over the tiers. Allow at least ¼ cup per person. The rule of thumb on this is 20 pounds of chocolate will feed 200 plus people. It should be high fat ‘couveture’ chocolate (33-60 % cocoa butter). Any fondues can jam the fountain machine, causing gaps in the tier’s flowing curtains. The best way to see if your fondue is smooth enough is to pour some through a large funnel. Your fondue should run through the funnel in about 8-10 seconds. 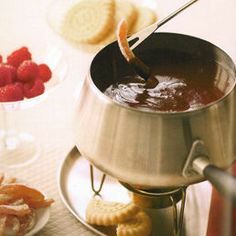 We have included the best recipes here, including the original chocolate fondue recipe from Chalet Suisse and Rachel Ray’s extravagant own twist. 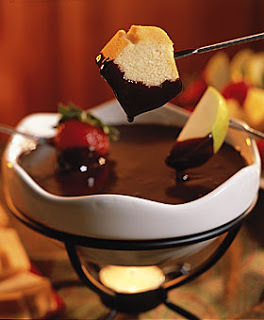 Before making the chocolate fondue, prepare the food dippers you are going to use with the fondue. This is a matter of personal choice. Some people stick with the traditional fruits like sliced strawberries and bananas, while others will include mandarin oranges and kiwi slices. Pound cake or angel cake bits are the bread favorite, but ladyfingers and tiny puff pastries are also popular dipping food. This original recipe may not be suitable for many chocolate fondue fountains due to the addition of almonds. Almonds may be omitted, and the recipe can be adjusted for amount of people that are going to be fed. Break the Toblerone and Tobler bittersweet chocolate into their separate pieces and place in the top of a double boiler, or in a small saucepan set inside another one partway full of hot water. Pour the cream into a small pan and heat separately. Stir in brandy right before serving. Did you know fondue started to take off like wildfire in the United State in 1952? Heat 1/2 cup cream in a heavy non-reactive saucepot over moderate heat until cream comes to a low boil. Remove the pan from the heat and add chocolate. Let the chocolate stand in hot cream 3 to 5 minutes to soften, and then whisk chocolate together with the cream. Stir in liqueur and/or chopped nuts and transfer the fondue to a fondue pot or set the mixing bowl on a rack above a small lit candle. If fondue becomes too thick, stir in reserved cream, 1 tablespoon at a time, to desired consistency.